Bowsite is visited regularly by some of the best elk bowhunters in the country. 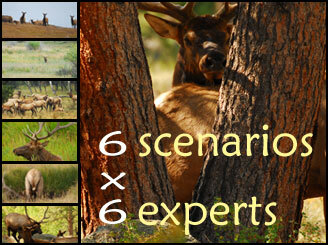 We reached out to six of them and gave them the following six elk hunting scenarios. Click the link next to each scenario to see how these experienced bowhunters handle these common dilemmas. Then it's your turn to discuss them here! It is early September and you have located the herd bull you have been patterning all summer. But now he has dozens of cows with him and will not leave them. It is 9AM and they are settled into the black timber. What would you do? The herd bull is responding to your cow calling and is coming in. He has just crossed a meadow 200 yards away when two rag horns emerge from the trees and are heading in as well. They are 100 yards closer than the herd bull. What would you do? It is opening week of elk season and temperatures are 75 degrees during the mid-day. It is also a full moon. The elk are nocturnal and not vocal. What would you do? While still-hunting along a high mountain bench you come across a muddy wallow and fresh elk sign. The area reeks of rutting elk. What would you do? You are hunting a section of private land that has been hunted a week before you got there and now all sign appears to be a week old. You can hear the elk bugling from the neighboring section that does not allow hunting. The elk obviously feel secure within that sanctuary. What would you do? Without warning, cows begin walking a downwind trail to 30 yards to your South. Moving is not an option since they are in plain view. The herd bull is bugling on the other side of the hill, out of sight, and following his cows. What would you do?